Summer is here and what could be better than cruising around in an open-top Porsche Boxster, with the roof down and the sun on your face? A new Boxster starts at around £45,000 which is great value for money if you have, well, the money; and let’s face it, you have to be reasonably well off to buy a brand-new Boxster. The great news is, though, you don’t have to spend anywhere near that much to enjoy top-down Porsche motoring. In fact, just about anyone can afford to drive a Boxster, because you can pick up a half-decent example for just £4000. Yes, for the price of a five year old Vauxhall Corsa, you can be behind the wheel of a Porsche Boxster. Ah, you say, that’s all very well but it’ll be nothing but trouble. No, it won’t, not if you buy carefully and choose a decent example; which is quite possible to do, even on a four grand budget. If you do, you’ll have a superb, mid-engined sports car oozing with Porsche heritage. Fail to buy well, on the other hand, and you’ll end up being, at best, disappointed and, at worst, out of pocket. So let’s discover the secret to buying a good Boxster for £4000 – a figure which we believe is the lowest you should pay for one; anything less will be a disappointment. We’re not going to go down the check every nut and bolt line; that’s not our style and if you know enough about cars to do your own mechanical inspection, then you don’t need our help anyway. Instead, we’re going to give you an overview of what’s available and help you to sniff out the best you can get for the money. At this price range there are three flavours of Boxster, differentiated by their engines. First, there’s the original 2.5-litre car made from 1997 to 1999 and with an output of 204bhp. Next up is its replacement, powered by a 220bhp 2.7-litre engine and offered from 1999 to 2004. Finally, there is the more powerful 3.2-litre Boxster S which ran from 1999 to 2004 and boasts 252bhp from its larger engine. At first glance, you may think that the S is the one to go for, and it has to be said that the extra power is tempting – the mid-engined Boxster layout is so capable it can cope with more than even the S’s generous output. However, don’t get too excited because, while our budget will get you an S, it won’t get you a good S. For £4000 you’ll be looking at an early, high-mileage Boxster S that’ll most likely look and feel more than a bit tired, and will probably need money spending on it, which would negate the point of buying a cheap car. And when we say high mileage in Boxster terms, we mean over 100,000 miles; these cars aren’t as durable as older Porsches and so do tend to look and feel weary when the miles get piled onto them. No, at this price bracket you are far better looking for a standard Boxster. 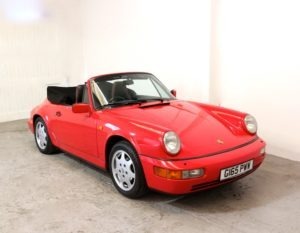 However, you needn’t feel short-changed by not having an S; even the original 2.5-litre has exactly the same power as an early 1980s 911SC, albeit in a slightly heavily package, so it’s no slouch. Furthermore, as if usually the case with Porsche engines, the smaller unit is more willing and revvy, at the expense of outright power and torque, so an early standard Boxster is fun to drive, even if it’s not got going to set the world on fire in terms of performance. That said, the extra 16bhp offered by the 2.7-litre engine, coupled with revised gear ratios, does make a worthwhile difference. The good news is, you can comfortably buy either a 2.5 or a 2.7 Boxster for £4000, and either will be fine. Generally, you should be able to get a better 2.5-litre example for the simple reason that an earlier car for the same money has to be superior in some way – usually it will have a lower mileage (we found a 1999 example with just £38,000 miles within our budget) or be in nicer condition. If we had more money to play with, we’d choose a 2.7 over a 2.5 any day, but as we haven’t then our advice is to be open-minded and look at both options, buying on condition and history rather than engine capacity. You’re better having a really good 2.5 over an average 2.7. That’s assuming, that is, that you can find a good early Boxster. As they’ve dropped in value, Boxsters have often not been maintained properly and many are disappointing. The key is to find one that’s been cherished and – at the risk of making a sweeping generalisation here – a Boxster that has been owned by a number of years by a retired Porsche enthusiast is likely to be better than one that has gone from one strap-cashed young owner to the next. With classic Porsches, the number of keepers is increasingly immaterial but with Boxsters, low ownership numbers is a bonus. How can you tell if a car has been cherished? Well, start off by looking through the history. A regularly stamped service book (every 15,000 miles or 12 months) is always good to see. It’s unlikely that the recent stamps will have been from a main dealer (great if they are, as it shows an owner has not been afraid to spend money) but a known Porsche specialist if fine; a back-street garage less so. Invoices to back up the service book are great news, as it allows you to build up a picture of what’s been done to the car, over and above routine servicing. Not only should you look for major work, such as a clutch change and brake disc replacements, but also minor non-essential jobs that are a sign of a caring owner. A good set of good-quality branded tyres is another. Now look at the car itself. So many Boxsters look tired, with parking dents in the doors, chips on the front bumper and bonnet (or, worse, badly resprayed panels). Early Boxsters have plastic rear windows (glass didn’t appear until 2003 so these will be out of our budget) although some cars have been retrofitted with glass panels (with varying degrees of success). These windows can discolour and crack – the trick to avoiding cracks is to lower the roof partway then use your hand (the famous Boxster chop!) to ensure a neat fold before opening it fully. Interiors don’t wear well, either, with seat bolsters looking scruffy and seat bases sagging. Check for wet carpets and non-functioning electrics, too. Full climate control was optional but worth seeking out over the standard heating system (which, to be fair, is rarely seen on UK cars) but do check it works and the air-conditioning blows cold; another indication of a caring owner is one who has attended to any faults, however expensive. Originality is another good sign of a conscientious previous owner. Modified Boxsters with aftermarket wheels, exhaust, stereo and so on hint at boy-racer tendencies, and such modifications can actually spoil an otherwise good car. Drive a Boxster and it should feel taut and relatively rattle-free. Most early ones will have the odd trim or hood rattle, but if the whole car is shaky and noisy, it’s not a good one. The car should accelerate smoothly without hesitation, and the handling should be predictable and inspire confidence. In short, it should put a smile on your face – if it doesn’t, there’s something amiss. But, you say, how can we talk about buying a Boxster without mentioning engine issues such as RMS failure, IMS failure, bore scoring and the end of civilisation? Because, as we said at the start of the feature, if you buy a well maintained example, the risk of these things happening (with the exception of a common but harmless RMS leak) is very slight, whatever Internet doom-merchants say. If the unthinkable happened and the engine does fail, then you can sell the non-functioning car for, say, £1000 and you’ll be £3000 down on the deal – less than a year’s depreciation on a new Boxster – but, with luck, you’ll have had many happy times with the car beforehand. The chances are, though, this won’t ever happen. It’s a bit of a gamble, but then aren’t most things in life? So what does our ideal £4000 budget Boxster look like? Well, it is a 1998 Arctic Silver and black leather example with just 48,000 miles on the clock. It’s had three owners, the last being a retired couple in Surrey, keen Porsche Club GB members who had had owned it as a third car for ten years before trading it in for a newer one. 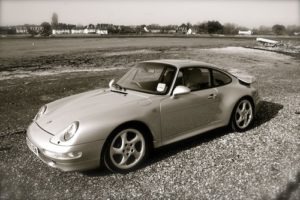 They’d had the Porsche serviced at a main dealer for the first seven years of their ownership before changing to a well-known independent specialist for its annual maintenance, and every invoice has been kept. It’s now being sold by that same specialist and will be serviced and issued with a six month warranty. Sounds too good to be true? Well, although we admit that’s a fictitious example, it is actually an amalgam of real Boxsters we’ve seen on the market recently, proving that it’s perfectly possible to find something similar within our parsimonious budget. There are plenty of used Boxsters out there, so you can afford to be fussy and buy the best you can find. Once you do, you can spend the summer cruising around with the roof down and a big smile on your face, feeling ever so slightly smug each time you pass a new Boxster. Does the world need a more powerful Porsche Cayenne? 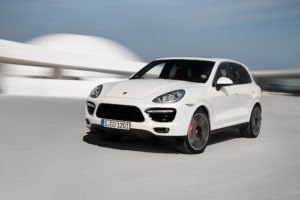 Probably not, but there’s no denying that the new Cayenne Turbo S is an attractive proposition.